The air is crisper. The days are shorter. I'm in the mood for more cooking of big pots of food. DD Jan and her young men have been working at our house finishing up a remodeling job. She's out of work at the moment, her younger son is home from the Air force, and her older son is about to go into the Army, so there is lots of young strong muscle available. It is useful to make a large pot of something for lunch; chili, beef stew, or whatever can go in a crock pot. Today, I was looking through the patternworks catalog and was surprised to see three of my designs on p. 60. 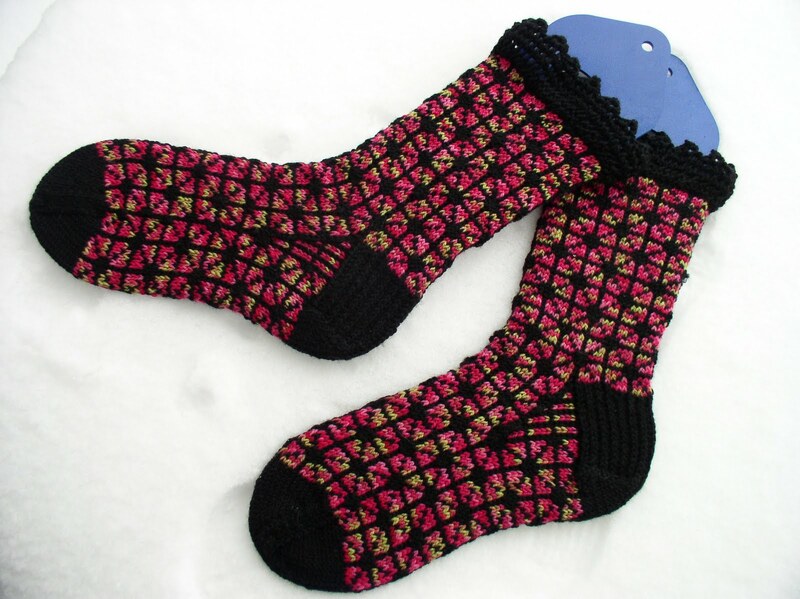 They are socks that I designed for Plymouth Yarn Co. Happy Feet yarn. The patterns available for download are: Church Windows, Heart Socks, and Diamond Socks. Of course I have more socks on the needles. The SKA group theme this month is black, or white, or black and white. I have black socks for a granddaughter with an October birthday. They're knit using a Cookie A. pattern called Glynis. The black yarn takes good light for working patterns. I've been doing a lot of the knitting at my shop. Business has been slow and the light is good. There is a monthly Mystery Sock designed by Adrienne Fong. Like her previous mystery, this one is beaded, but the beads don't show up in the photo. If that's not enough, there is the birthday sock for DH. I joined the Ram Club last year and received three sock kits. 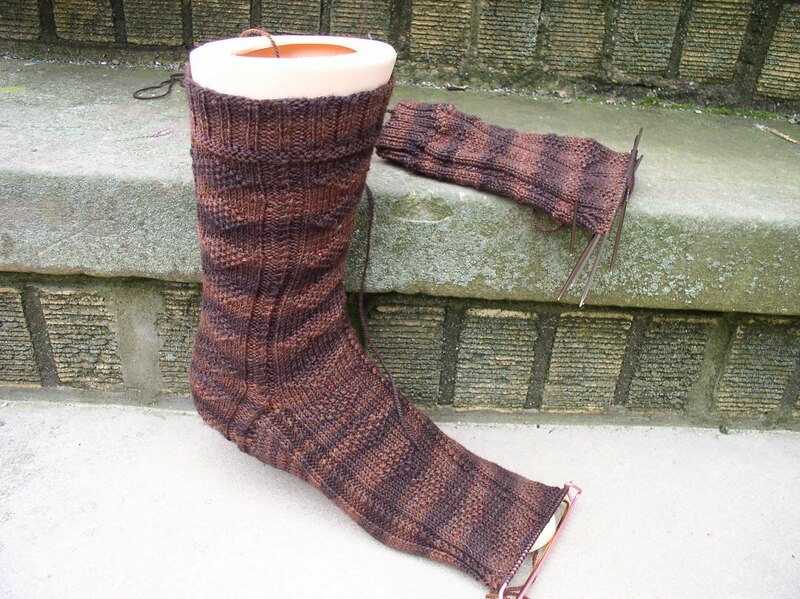 This is one of them, but I'm using different yarn, hoping to knit the toes in the same color. Sock #1 is on stitch holders until the yarn quantity is determined to be enough. It makes the sock look funny. My gray sweater is growing slowly, ignoring it and working on small needles with thin yarn does not make for fast progress. The baby sweater will be finished in a few days. It has been reserved for intense TV watching, where more pattern knitting is distracting.